Just released! Using the same bestselling design as our Nut rollers, the Stab-A-Nut is a handheld nut gatherer that captures the nut in its magic fingers and doesn't release until you utilize the push release on the handle. Simple to use-- anyone can do it! This product is new this season and a quality built construction made in the USA! Lightweight, handheld, portable! Gather nuts anywhere! For a limited time only, free shipping! Size 3/8" to 1 1/2" is designed for Pecans, Almonds, English Walnuts, Macadamia Nuts, Sweet Gum Balls, and Large Acorns. Size 1/4" to 1" is designed for Small Acorns and Joba Beans. 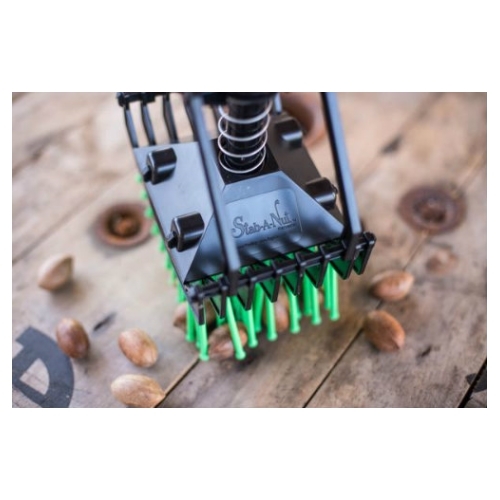 Be sure to watch our video that explains just how easy it is to stab, collect and release nuts with our Stab-A-Nut nut picker upper.